Each package contains the three patterns shown. So if you buy one package you will receive three different designs. "I recently purchased a gown from one of your competitors (at twice the cost) and a gown from you. It was my first time to buy hospital gowns and I assumed their gowns must be better, they were twice the price. Your competitors gown arrived and one of the snaps does not work! Now I have to take the time to return the merchandise (and I don't think they will reimburse the postage). I am thrilled with your product. 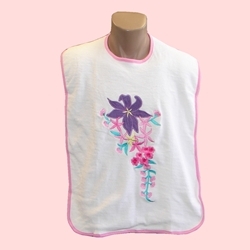 I also ordered 3 bibs (Embroidery Adult Bibs). They are beautiful! I am a little hesitant to tell the nursing home staff to use them for fear they will disappear. Thank you for providing these necessary items at a reasonable price. You are really appreciated."